Optoma is taking on LG and Hisense with a new 4K ultra short throw projector that bundles everything needed for a smart home theater in a single package. 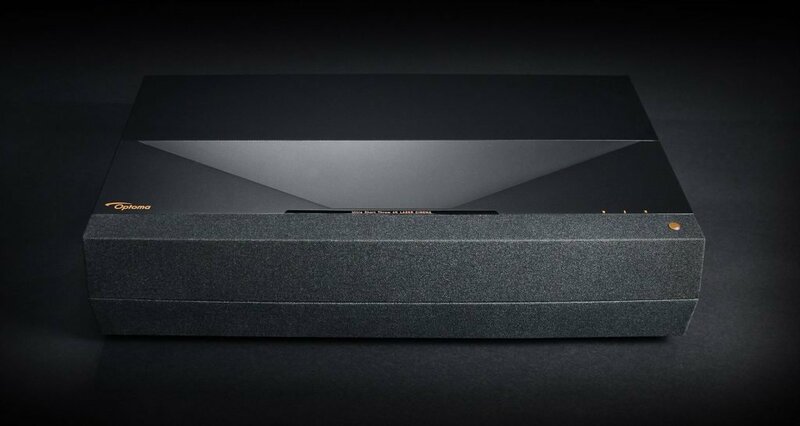 The company’s P1 Smart 4K UHD Laser Cinema was launched at the Consumer Electronics Show in Las Vegas this week, and combines Optoma’s newest projector with a NuForce Dolby Digital 2.0 soundbar that comes with built-in woofers, and voice controls via Amazon Alexa and Google Assistant. Ultra short throw projectors are all the rage at CES this year, as these boxes can be positioned just inches away from a wall and still throw up massive and gorgeous images that put many a large-screen TV to shame. Optoma’s ultra short-throw projector looks like a serious bit of kit, capable of throwing up a 3,000 lumen, 8.3 million pixel, 120-inch display onto pretty much any surface. It also supports high dynamic range in the form of HDR10 and hybrid log gamma (HLG), which the company said will ensure better performance, brighter whites and deeper blacks. Sweetening the deal somewhat is the integrated soundbar designed by NuForce that comes with individual woofers, full range drivers and wide frequency response. It also features Dolby Digital, Dolby Plus and DTS audio decoding, which combine to deliver clear and balanced sound for a more immersive listening experience, the company said. The system also boasts voice controls with support for Amazon Alexa and Google Assistant, something that’s become almost obligatory at this year’s CES. Other features include IFTTT support that allows Optoma’s projector to talk to other connected devices, and access to streaming services such as Netflix and YouTube. Optoma’s P1 Smart 4K UHD Laser Cinema will compete against LG’s CineBeam Laser 4K ultra short throw projector and Hisense’s TriChroma Laser TV, both of which were announced at CES this week. Optoma said its P1 Smart 4K UHD Laser Cinema will go on sale in the second quarter, and is expected to cost around $2,999 (around £2,350) though the exact price has not been confirmed.